Like any weapon you are responsible to know your local weapons codes and how they apply to you. In most all cases nunchaku are permitted to be used in martial arts schools and to be studied by students in a responsible way under the instruction of a martial arts teacher. Like any weapon for example a gun, bat, taser, sword or knife, you must know your local laws as to how you can legally carry any weapon, including nunchaku. Yes we do ship to California and Mass, however we state in our terms that while it is legal for us to export them, it is technically illegal for you to import them into these three states unless you are a licensed martial arts school or a student of a licensed martial arts school. We offer the option to have them unstrung and sent to you which is perfectly legal in these states. If you choose this option we send along length of para cord and a stringing tool so you can sting them yourself. Another option is to have them shipped to your martial arts school if you are concerned as a registered martial arts school in these three states can receive them for the purpose of instruction. You can check the option of Unstrung to be 100% compliant regardless of the state or shipping destination. It is the buyers responsibility to know your local laws regarding the purchase and use of any martial arts weapon. The buyer agrees to these terms and conditions upon check out and takes responsibility for the purchase of these items and there use according to the local laws and regulations of the buyer. You must be 18 or over to purchase nunchaku from us. Agreeing to the terms & conditions states that you are 18 year old or over. Nunchaku are only legal in these states if you are a student or teacher in a legal registered martial arts school. 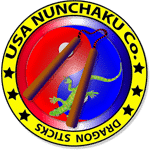 To learn about nunchaku laws please visit the following links to learn about the laws in your area.